Son of Texas and financial seer, John Mauldin, believes the stock market could shed 40% in the near future (SPX). John is the president of Millennium Wave Advisors, LLC, a Dallas, Texas based investment advisor, with $600 million in assets under management. 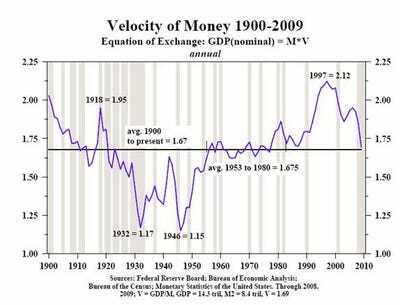 John worries that the velocity of money, an indicator of how many times a dollar is reused in the economy, is collapsing. This ratio, which is defined by the GDP divided by the money supply, bottomed at 1.15 in 1946. It peaked at a breathtaking 2.2 times in 1997, near the top of the Dotcom bubble. The ratio has been retreating ever since, has recently accelerated down to the 100 year mean, but still has much farther to fall to get to the bottom of the 100 year range. 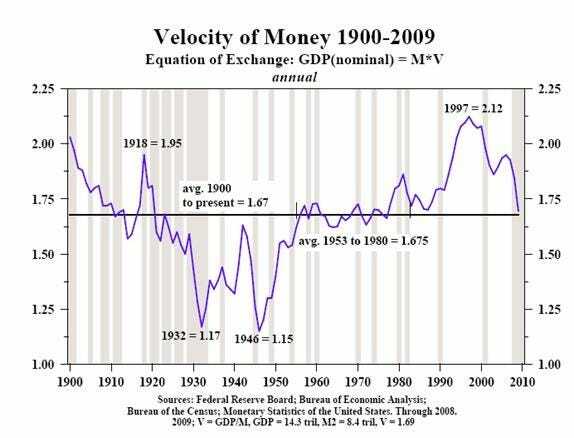 The collapse of velocity signals the end of a 50 year super cycle in lending. For you and I, this means lower economic growth for perhaps another decade. It is partly the result of banks getting generous funding from the Treasury, and then sitting on it. The bucks simply stop there. It suggests that no matter how much money the government pumps into the economy, it might as well be pushing on a wet noodle. 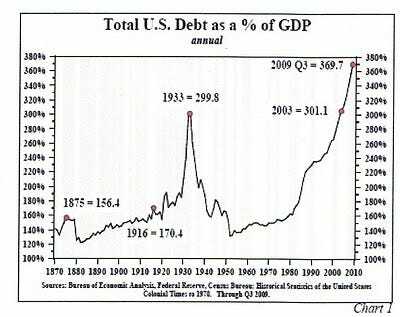 The gold bugs have got it all wrong, simply focusing on money supply growth and expecting hyperinflation. A lot of money can sit and go nowhere. The inflation will come back with a vengeance when the economy revives and banks finally resume lending. With so much new money being created in the last two years, the chances of the Fed being able to head this off are close to nil. Similarly, the bond vigilantes may have to wait a couple of years for their big move down in the 30 year Treasury bond (TBT). 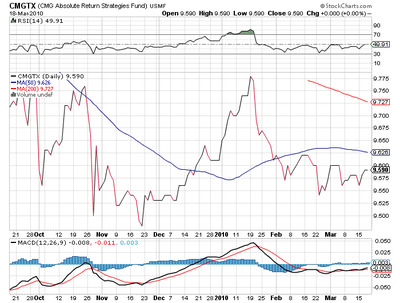 When the bond markets call “times up,” the US will be forced to embark on some highly deflationary spending cuts. If this happens during a recession, it could be a disaster. John thinks there will be a substantial slowdown in growth in Q3 and Q4. With anticipated federal tax increases of 2% of GDP in 2011 added to a further 1% in state tax hikes, the recovery will be strangled in its crib. That’s when the risk of a double dip recession explodes. Over 3-4 years higher taxes could add up to a burdensome 9% drag on GDP. 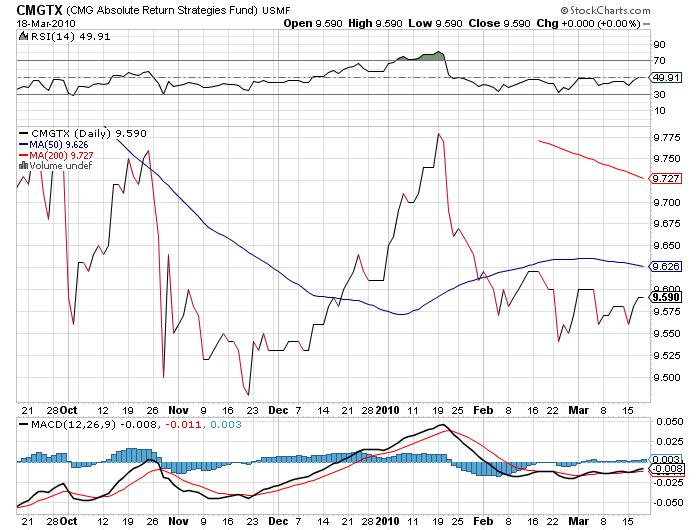 John says that emerging markets (EEM) will decouple from the US and keep powering up, as this is where the real economic growth is (EEM). He has been a gold bull since 2002 (GLD), when it was below $300/ounce, and isn’t backing off from that position, but prefers to own it against Euros at this point. He thinks the entire premise for the existence of the European currency (XEU) is questionable, and sees it eventually moving to parity against the dollar. John doesn’t manage money directly himself, but outsources assets with market timers employing a number of different models. One firm he has particular success with is CMG in Philadelphia (CMGTX). He really only selects individual stocks in the biotech area, which he thinks have the potential to develop into a bubble, and has a variety of small cap and microcap holdings. Not pulling any punches, John said that the Republican leadership of the last congress was “criminally incompetent” in the way they unnecessarily squandered surpluses and spent their way into oblivion, leaving us without dry powder to fight the current crisis. John has an incredibly diverse past, which includes a degree from Rice University, a stint at divinity school, and time spent running a check printing company which led him into newsletters. Today, his two letters, Outside the Box and Thoughts From the Frontline, go out on the Internet to 1.5 million readers a week. John is the publisher of three investment books, The Millennium Wave, Just One Thing, and Bulls Eye Investing. To learn more about John’s many activities in the markets, please visit his website at http://johnmauldin.com/ . To catch my entire insightful interview with John Mauldin on Hedge Fund Radio, please click here to go to www.madhedgefundtrader.com/ and click on the “Today’s Radio Show” menu tab on the left.